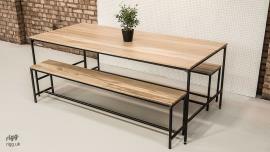 What a great way to introduce character into a modern or period property - strong, matching wood and steel furniture. 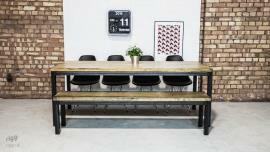 Many of our valued customers who have bought one of our industrial dining table and bench sets have chosen 2 benches, whilst others have mixed-in chairs. Whilst the former route can look very clean and uncluttered, having one bench and a collection of wooden stools or perhaps brightly painted spindle-backs can look fab. In fact the character materials look especially good when accompanied by splashes of bright hues. 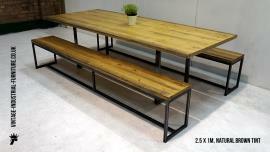 The "lived-in" style of our robust industrial dining table and bench sets is perfect for a busy household. Homework, meal-times and the occassional junior painting and crafting session are easily handled. The sustantial real timber tops are hard-wearing and forgiving. The odd ding from a young enthusiatic family member is lost in the lightly rustic pattern. However the surface is nicely flat to allow spills to be easily wiped-up with minimum fuss. The best of both worlds - enduring character but practical and essentially maintenance free. Just an occassional wipe over with a damp cloth. The frame and legs are similarly supportive of modern busy lifestyles. Made of welded and bolted high quality steel, the structure will certainly last for many years. For a given size, the metalwork is able to carry high loads compared to traditional wooden versions - so there is more room for humans! We offer a range of leg/frame formats to suit different tastes and seating preferences. A bench has the possible flexibility of permitting an extra person to be accomodated now and then - such as celebrations when family and friends are visiting. Most of our designs allow a long bench to be fitted under the table thanks to the unobtrusive legs. Typicially you could fit 4 people on a 240cm table. The 180cm/6ft. model is usually considered the smallest for 6 people. The smallest 150cm model is ideal for smaller kitchen-diners to seat 4 people with the addition of a seat at each end when needed.